Don't say you weren’t warned. Now that we’ve gotten that out of the way, let’s talk LOST! Uh...hello! Didn't see that one coming! Total shocker! I guess Sayid was right... the last thing he said to Ben (on the pier, before the plane trip back to the island) as he walked away was: "If I ever see you again, it will be extremely unpleasant for both of us." He was true to his word! Why did Sayid think that his purpose for coming back to the island was to kill Ben? Does he think that will stop all the killing and loss of life Ben causes in the future? What is he going to do now that he's escaped and Ben is dead? Go live in the jungle by himself and slowly go crazy like Rousseau? Join the Others? Try to find a way home? What about Ben? Did the Benry we know and love...err hate... disappear in the present day? Will the Purge still happen even though Ben's dead? Will the Losties' memories of Benry be erased? And what about Faraday's/Hawking's rule that you can't change the events in time; that the universe will course correct? How do you course correct something as final as a death? Then again, death didn't stop Locke. Maybe the island will resurrect Ben? Maybe he isn't all the way dead, but just mostly dead... Argh! The questions! And you know Damon & Lindeloff are going to wait an episode or two and let us suffer before they come back and address this plot thread. Oh, the exquisite torture of being a fan of this show! Sayid: Do you work for that man? He is a liar, a manipulator and a monster! Ilana: Why would anyone work for a man like that? Sayid: You were right about me. I am a killer. When Sayid was in the airport with Ilana and saw who was going to be on the plane with him... the dawning realization and dread that crossed over his face... And later, when he told Little Ben he was right, that he is a natural born killer... the anguish on his face... wow... that was just some great acting on Naveen Andrew's part. I was really grateful that tonight's episode was a Sayid-centric episode. I had forgotten how much I'd liked him, how much I'd rooted for him to get over his past, how much I want him to be happy. I want every one of these characters to redeem their past, to come full circle... I want them all to have a "Charlie Moment". Charlie overcame his drugs, overcame his dysfunctional past with his family, got past some other ugly selfish behaviors, rose to the occasion and sacrificed himself for others - a selfless act of love. I want every one of these characters that I care so much about to have a "Not Penny's Boat" moment... that moment where you are in awe of the victory they have won over their own "FATE". Originally, that seemed to be the heart of this show - redemption and victory over circumstances and fate. Hurley: They're, like, living together...not like roommates. Such clever writing in this episode, when Sayid was under the truth serum, that he answered truthfully about who he was, how he got there, etc. but didn't blow their cover. And it was written in a way that didn't feel like a cop-out by the writers. What a creative team! 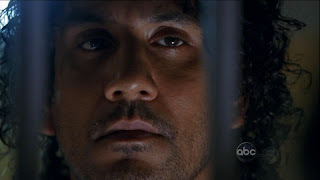 I wonder what the ramifications will be of Sayid's escape, and the fact that someone helped him escape. Methinks that peaceful little Dharmaville is going to get all shook up by this, and that the Losties' cover will be blown soon. What do you think? And please give me your answers on the dead Little Ben thing, because I need to be able to sleep tonight! ha ha My mind has been racing ever since the credits started rolling on last night's episode! Leave me a comment and let's discuss! Allegory is a form of extended metaphor, in which objects, persons, and actions in a narrative, are equated with the meanings that lie outside the narrative itself. The underlying meaning has moral, social, religious, or political significance, and characters are often personifications of abstract ideas such as charity, greed, or envy. Thus an allegory is a story with two meanings, a literal meaning and a symbolic meaning. Purely by coincidence, I’ve read a lot of allegorical novels in the last year, which prompted me to write this post. All fiction uses some type of allegory, depending on how much the author is into using symbolism to convey the deeper meanings and themes of his story. To clarify what I mean when I say “allegorical novels” though, are novels where the whole framework is being used to represent abstract ideas and demonstrate some thesis. They do so in a way that tips the reader off to the “game” of this dichotomy, so that the story can be enjoyed on both levels – the basic plotline, and the deeper symbolic level. Sometimes they’re successful; sometimes they're less so. Surprisingly enough, out of all the allegorical novels I've read this past year, the two which I enjoyed the most and felt like were successful both in their purpose and as a piece of literature, were Young Adult fiction and were both about the art of language: Haroun and the Sea of Stories and The Phantom Toll Booth. By pure chance, both of these novels had an overall theme regarding language and storytelling. Haroun was a fairy tale which, in and of itself, was an allegory about the lost art of telling fairy tales. It celebrates the art of storytelling and the beauty of stories, while also being the very thing it's talking about. You can read my full review of it here. The Phantom Toll Booth by Norton Juster is similar in that it celebrates the beauty of language itself. A very bored boy comes home one day to find a mysterious toll booth has appeared in his room. He pays the toll and through it enters a strange world full of eccentric characters. It is very much an “Alice in Wonderland” type adventure. The book is filled with brilliant satire, double- entendres and irony. The author revels in the wonder that is the rules and structure of language and creates personifications of the various tools of writing. I suspect that anyone who has an appreciation for language and literature will thoroughly enjoy this book. In both of these stories, I was invested in the main characters, like I would be any other fiction work. I was concerned for their safety, cheered them on in the battle, and celebrated with them in their victories. I was interested in the plotline and curious to see how things would turn out. Haroun even made me cry a little bit, with the pure joy of its fairy tale happy ending. 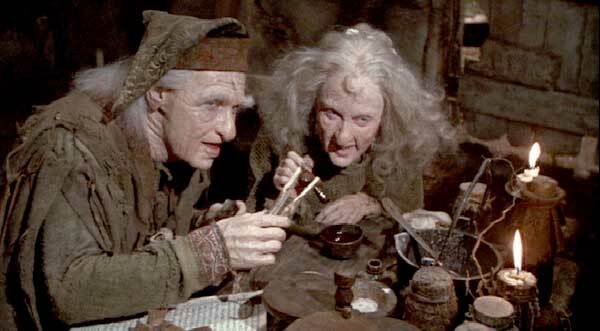 So far, I've described what any good work of fiction should do: engage, entertain and maybe even inspire. Yet, with allegorical novels, it's almost as if you have to read them with a split mind, because you're also appreciating all the deeper meanings carried in the allegories of the characters, the locations, etc. Everything in an allegorical novel is symbolic for something else. There would be times, when reading these novels, that I would stop and think about what was going on and realize that the deeper allegorical level of the novel was working just as well, and was just as tight, as the top-level plot. 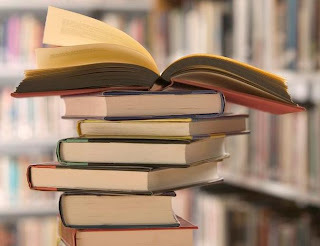 The allegorical aspects of the novel never interfered with the enjoyment of the story, or detracted from the emotions and humanness of the story. If anything, the allegories only added another sweet, rich layer to what was being said. These are just two examples of what I consider to be good allegorical novels. However, this past year I've also read two other allegorical novels that left much to be desired. I will discuss them in a separate post. In the meantime, leave me a note and let me know what your favorite allegorical novel is. The Chronicles of Narnia is another favorite that comes to mind... what about you? Grab your bell-bottom pants and your big-collared paisley-print shirt, Losties, 'cause it's time to disco! 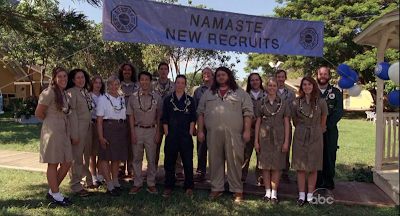 Say "Namaste" to 1977 and the Dharma Initiative! The gang's all here... sort of... so let's get talking! Little Ben (to Sayid): My name is Ben. Radzinski: Well, that was the last station to check in, the Looking Glass, and they have no record of a plane crash either. I had a sneaky suspicion (as I think most of you Losties did too) that the plane full of non-Oceanic 6 passengers crashed in a different time than when the Oceanic 6 purple-light-beamed themselves to. That was confirmed on tonight's show, along with the fact that the crash is located on Alcatraz (i.e. the smaller station where the Hydra station is located). How terrific is Lapidus, guiding that plane down with a cool hand. I want him to be my pilot the next time I fly! But what I don't understand, is why Sun, who was part of the Oceanic 6, didn't purple-light-beam jump with the rest of the six? Is it because the Island knows she has dark intentions? She has become such a ruthless person, and has changed so much since the repressed gal we first met in Season 1 and I don't much like her now. I thought the hope of finding Jin alive would change her some. Although she's nursed her hatred and revenge for the last three years, so I guess I shouldn't expect her to shrug that off overnight. Also, most of us Losties did the math with a calendar, once we knew we were spending some of our time in the 70s, and figured we'd see Young Ben at some point, as part of the Dharma Initiative, but I didn't expect to see him this soon, or in this particular episode. When Sayid was looking at him, I couldn't help but immediately think of "Benry" locked in the weapons safe, eye all swollen shut, after Sayid had beaten the tar out of him. I wonder if that's what Sayid was thinking about. Maybe he was thinking about how Ben had conned him into being his hired assassin. Is Sayid (or someone else) going to try and put an end to things early, and kill Young Ben to avoid all the terribleness and death he causes later? Faraday and Mrs. Hawkings have both said that you can't change events. That the universe will course-correct. Would killing Young Ben now save the Dharma Initiative from the Purge? Or would the Others just find some other way to kill them off? Sawyer (to Juliet): They came back. There weren't too many heartbreaking or touching moments tonight, but when Sawyer sat down on the edge of the bed next to Juliet and told her the Oceanic 6 were back, it was so sad. You could feel the unspoken confusion, uneasiness and disappointment between them. They were happy and well adjusted in their new life together. The Oceanic 6 returning (more specifically Kate and Jack returning) severely complicates what they have going on. I'm not really as interested in this relationship quadrangle, as I am other aspects of this show, but I must admit, I'm curious as to how this is all going to play out. Are Juliet and Kate going to catfight? Is Jack going to rub it in Sawyer's face that he and Kate played house and were engaged? Sawyer (to Radzinski): "Great thinking, Quickdraw!" Another great line was Hurley saying, "I vote for not camping." All in all, there weren't many funny lines tonight. The show was intense and focused on moving the plot forward and getting the Oceanic 6 assimilated into the Dharma program. So here's the remaining questions I have for tonight. How are Ben, Locke, Sun and Lapidus going to re-join the rest of the Losties, who are currently locked in the past? Are Sun and Jin ever going to be reunited? (I don't feel like Sun is really concerned about it. Perhaps she doesn't believe he's still alive? She obviously doesn't trust Ben as far as she can hit him with an oar.) How are they going to handle the Sayid problem? Where did Daniel Faraday go to, if he's no longer on the island? Did he go back to Oxford to start his experiments again? And what in the world is up with Christian Shephard? Is it really Jack's dad, or is Jacob just using his form? And where is Claire? (Other than appearing in the new Johnny Depp movie.) What do you think? Leave me a comment and let me know - we have A LOT to talk about! I know I say this every week, but these LOST posts are getting exponentially harder and harder to write. There's so much to talk about, and each week the format of the show seems to change. Time displacement is the only constant. (Pun intended!) I love how this episode just shifted back and forth between a three year time period: when the island Losties joined the Dharma Initiative in 1974 and then three years later (1977) when the Oceanic 6 return (from 2008). Still following? :-P I'm going to sound totally geeky saying this, but this episode reminded me of sci-fi stories and movies, where one person leaves Earth and travels through space in suspended animation. Even though they've only been gone for a couple of years, it's been a lifetime on Earth and when they get back the realize everyone they've known has moved on or is dead. Again, it's hard to pick "the" most shocking moment of the night, since almost every five or ten minutes in the show there is a shocking moment. However, I think hands-down tonight I was completely surprised to see the four-toed statue in its complete form. I wonder how it gets destroyed? Who built it? What does the front of it look like? Did the Others worship it? I hate to admit it, but I thought the four-toed statue/foot was just a weird little red herring the creators threw in for fun. I never expected them to ever explain it or come back to it. Oh ye of little faith! I should have known better... I now suspect that we will in fact get the story behind it. Horus saying, "Is three years long enough to get over someone?" Poor Daniel. He accidentally fried Theresa's brain at Oxford with his experiments, and then his attempts to protect Charlotte from the island's time-jumping failed. I really felt bad for him when he was mourning Charlotte's death (and he couldn't even give her a proper burial because they time-jumped and her body didn't go with them). But when he looked up and saw the little girl Charlotte, happy and alive... ugh... the pain on his face... it broke my heart. I wonder if he's going to try again to warn the little girl Charlotte to not come back (as Charlotte "remembered" before she died) or if he's going to try a different tactic to change time and events? 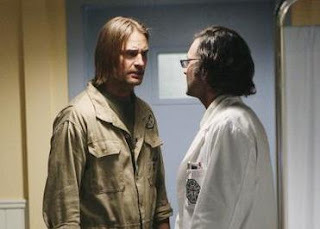 Sawyer: "You think this isn't going to get out? It'll be on the coconut telegraph by breakfast." We can always count on Sawyer to have a funny quip or line. However, the best line of the night was Daniel: "The record is spinning again. We're just not on the song we want to be on." Sawyer's character arc has gone in an interesting and somewhat unexpected direction. I've never really liked him, from the first time he was hoarding medicine and wouldn't give it up (or at least fess up that he didn't have it) when Shannon was practically dying of an asthma attack to the big con he pulled on the camp to get all the guns. I always felt like he was a cruel, selfish jerk. I had some sympathy for him, when we saw his backstory about the man killing his dad, but really this is the first time I've actually kinda sorta liked Sawyer. Interesting that once he killed Sawyer the con-man who killed his father, and made peace with his past, it freed him to step up and be a good guy. It's like he reformed. Now he's acting like a hero, trying to protect the others, being a leader. I thought it was interesting that Miles asked, "Who put him in charge?" 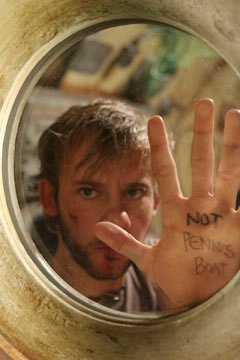 Funny, some of the Losties asked that about Jack in season 1. I don't know what to think about Sawyer convincing Juliette to stay, and then hooking up with her later. It seems to all be out of convenience and loneliness. And now Kate and Jack are back, and the love quadrangle is in full swing again. What do you think? Leave me a comment and let me know - we have A LOT to talk about!